CapitalTruck had the most liked content! I was PO’ed when I had to change drivers side turn signal bulbs. Little did I know that it was a cakewalk compared to the right side bulbs. Removing air cleaner box and reaching through that hole to change the bulbs is a real peach. Just disgusting. I always do wires because I figure, what the heck, its every 100k miles. Plus, I end up twisting the snot out of them to get them off. These are not hard plugs to change. Dont mess with the gap on the iridium plugs, regardless of what any manual says. Leave them be. At least if you use OEM plugs you know youre in good shape. I have had good results with the dealership for tires. They sell them as loss leaders. Plus, a high end Hunter road force balancer is a mandatory tool for GM shops. Just changed mine out at 108k miles. They didn't look too bad. I replaced them with OEM. OEM wires also. Ill tell you one thing, I’m glad I did passenger side first. Drivers was a breeze after that. Regardless, none of it holds a candle to my moms 07 Highlander with the transverse V6. That thing was a nightmare. Those Wrangler AT/S get bad reviews, but I love mine. I specifically sought them out because I like the quiet smooth ride. They seem to balance very nicely. 2006 2wd with Torsion Bar front. Always have trouble finding shocks. I didn't even know it was an option. Is that the BTN package on the factory equipment list? Looking through ACDelco catalog is 540-160 your correct part number? What happened? Blistein or shop issue? I replaced my OEM links with Moogs after it started clanging one morning on the way to work. I replaced them in my work parking lot with my tire jack and a socket/wrench set. 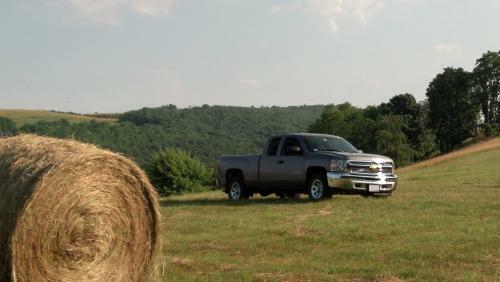 I had an 04 4.8 2wd Ext Cab 4L60E with 3.73. It had a tow capacity of 7100. I towed a 6500 pound boat from Delaware to Corpus Christi Texas. It was third gear pretty much the whole way. Those Tennessee mountains were a 2nd gear hazard flasher operation. It made the trip with no problem (I had added an auto trans cooler before the trip). However, I would recommend a greater margin of safety than what you're mentioning. With the 3.73 you'd probably be okay, but with that 3.42, forget it. I have a 13 with 4wd ext cab 4.8, it is listed at 5500. I have come close to that and I sure wouldn't want to do it for long term. I had high hopes for a retro Bronco like redesign. Instead I got a disappointment. 2013 Silverado Possible Issues After Battery Replacement? Zero issues with these trucks. I’ve done my 2013 with no problems. Did it the same way I did it in a 63 Impala I used to have. My first experience with one today. The OEM GM belt comes with a little installation tool and really good instructions. I was all against them conceptually until I changed mine out today. I’m a fan now.